Triple Stack 889-495 weaned at 870 pounds to ratio 120 with a yearling weight of 1593, which was a 118 ratio. He scanned a 17" RE. He will add frame with a knockout phenotype. He is wide based, thick, deep ribbed, and level topped. 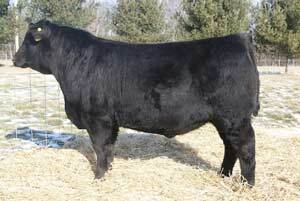 At $17,000, he was a 2010 Musgrave sale topper, selling to Hoover Angus.